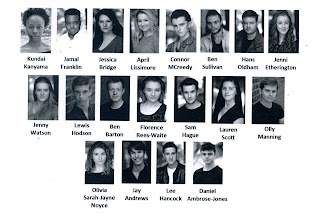 Last year I saw Orientation, one of two devised shows that form the first part of public performances from the now grown-up third years of the University of Northampton BA Actors course. It was a simply incredible beast of a show, which remains very possibly in my top five shows that I have seen, anywhere. 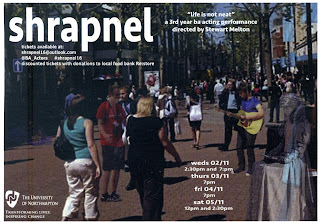 Shrapnel, this years first devised show directed by Stewart Melton doesn't come close to that, however that far from means it is a failure. It does though have a more punchy moral at its core. 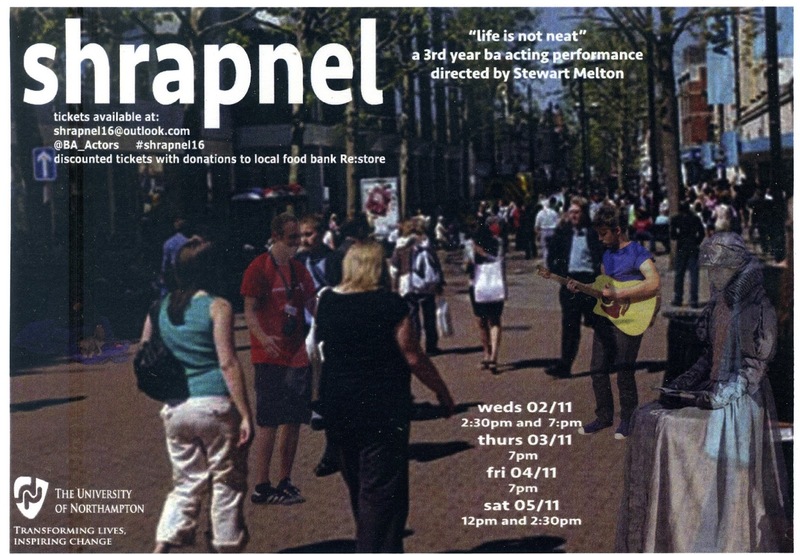 Formed purely from the work of the actors and directors and their knowledge and research of life on the streets, Shrapnel tells the story of the homeless, the charity chuggers and the passersby. The chuggers are perhaps the key characters in this piece, driving the greater part of the witty repartee and emotion. Played by Kundai Kanyama, Jamal Franklin, Jessica Bridge, April Lissimore and Connor McCreedy, each brings their own particular quirk to their role, making them all very much individuals. My particular favourites have to be Connor McCreedy's new charity worker Jack. He has a particularly brilliant scene away from the other chuggers where he is keen to please (and keep his new job secret) from his "friend" played by Lauren Scott, it's awkward, emotional and oh so realistic. Another highlight from the chuggers is Jessica Bridge's Harry, a character that perhaps remains an enigma to the very end, but is at the core a deeply troubled character. Indeed, there is the underlying fact that nearly everyone in this play is sad or troubled in some way, which does make me a little worried about how the actors portray life to come up with such a show. Elsewhere in the cast, a silent form for a first part of the play is Florence Rees-Waite's street artist, busily creating a sketch of a street beggar while the cast create the world around her. When she eventually speaks, it is in a quite dramatic exchange with a rude passerby played by Lee Hancock. They have a sparky exchange, which she wins, simply by being just a nice person. From this point, she becomes a key character and quietly and unobtrusively becomes one of the strongest performers in the cast. This on top of her drawing, balloon making and quiet control of the stage lighting as well, is nothing short of a brilliant achievement. Lewis Hodson's beggar with his dog Lennie (Ben Barton) were a likable pairing and as the story developed, it became a more troublesome, and eventually very sad tale. Hans Oldham makes a true impact as the one regarded (and dressed) as Jesus. At first he is a fun, and apparently happy soul, keen to please with offers of wine gums (although he is clearly a charlatan, as they are midget gems). Later though, he reappears as a more troubled man, and leaves a lingering sadness with the audience. Of the separate scenes, one really truly strikes a cord, a bag lady (Jenni Etherington, channeling an impressive Julie Walters style performance) wheels her laden trolley across the stage, then back again and proceeds to create a living room with a couple of mats and a quilt. She is then joined by a collection of homeless folk, who must at all times wipe their feet on the welcome mat. It is played very much for laughs by the cast, and while funny (and the students present lapped it up). Myself and fellow blogger Chris Sparkle remarked as slightly more long in the tooth folk, that this was actually a really sad scene as well. Certainly, the best individual one of the show for me. The rest of the cast each have their own key moments, as such with a devised show. This leaves some scenes in perhaps, that would get chopped on a final, slightly more polished product. However much of the point of shows like this, are learning the craft and not specifically to entertain the public, so everyone needs their moments to shine. Therefore I excuse the scenes that perhaps would normally be pruned away. The only other real problem with the show and actually quite a surprise, is the decision to run it without an interval. I perhaps could see the reasoning of telling the tale complete, however I do think that a flexing of both mental muscles in an interval chat, as well as physical ones could have increased the enjoyment of the piece. So, not the best devised show, but an incredibly clever and provoking piece, which leaves lingering thoughts in the mind beyond the walls of the theatre space. 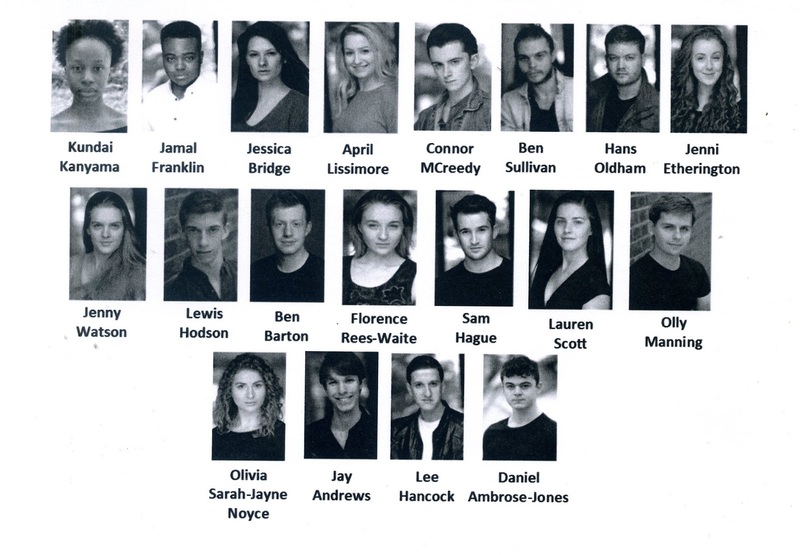 This group of actors have grown again since the incredible Shakespeare shows earlier this year, and now look ready for the final run towards the Royal, Flash and beyond. Performance viewed: Wednesday 2nd November, 2016 (matinee) at Isham Dark, University Of Northampton (Avenue Campus).